Eirik Stubø. Photo: Soren Vilks. Norwegian stage director Eirik Stubø is Dramaten’s current Artistic Director, after spending many years as the head of Norway’s National Theatre. One of the highlights of the 2018 Ingmar Bergman International Theatre Festival was Stubø’s production of Erland Josepson’s play A Night in the Swedish Summer, a poetic mediation on Josephson’s real-life experiences shooting The Sacrifice, Andrei Tarkovsky’s final film. 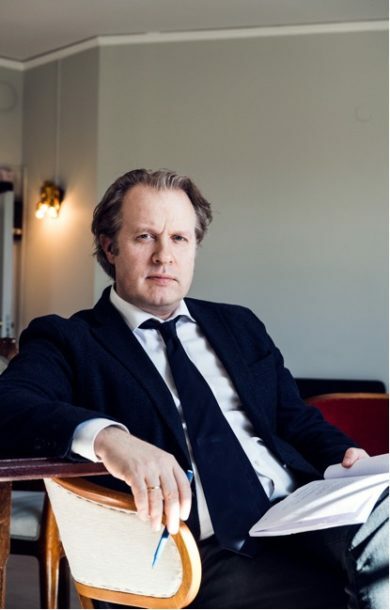 I had the great pleasure of sitting down with Stubø and chatting about The Festival and his production of Josephson’s play. Here are edited excerpts from our conversation. In your time as head of the Norwegian National Theatre, you oversaw many Ibsen Festivals. Now as head of Dramaten here in Sweden, you are head of the Bergman Festival. How is that different? When I came to Dramaten, they had already done two Bergman Festivals – in 2009 and 2012. Those festivals were very different from today’s Festival in the sense that it took place at the end of the season in June. And it included only guest performances. They didn’t produce any new Dramaten productions just for the Festival. This Festival is a model I adapted from the Ibsen Festival. We did maybe three or four of our own productions that opened the Festival, and then came the guest performances. What is important with this model is that I want it to open the season, instead of it being it at the end. And I wanted to integrate the Dramaten performances into it. And it’s a way of presenting international plays – both Bergman’s and other kinds of modern drama – in Stockholm, and at the same time promote Dramaten to other theatres. So it’s a two-way street. It’s bringing in [foreign productions] and also sparking the interest and presenting our work to international guests, who most often are producers of theatres themselves. These meetings we are having now with good directors and good companies are very important for the future of Dramaten and Swedish theatre. How do you find and decide which plays from outside to invite? Nowadays, even DVDs are out. There are links [to websites]. In the digital era … I could sit here with my colleagues and we could watch on a huge TV screen 4 or 5 hours of this show, or that show. The Festival features many stage adaptations of Bergman films. What about the argument that film language and theatre language are two distinct things and one does not necessarily easily translate to the other? Yes. What especially I like in Tarkovsky, there is something in his ethics…not just a religious belief in God, but also a belief in the need to be yourself, to rely on yourself, to respect yourself and how hard it is to be yourself because we all want to be liked. Yes, that’s right. [The protagonist] is obviously somehow more fascinated by this Lotti character than Lotti is with him – there’s Vanya for you. There is a Chekhov take on many of the [plot elements]. At the same time, the play is like an essay. But there is this third level –almost half the play, at least to me, is substantially about Erland and Tarkovsky speaking Swedish to each other and these scenes contain the most interesting aspects of the play, and why it came to be. Erland wanted to know – because it was so strange for the Swedish actors – why is he doing this? Why does he say that you need to believe in God to be a real artist? Or at least, a director, even though he doesn’t necessarily believe in God; he must speak to him. Yes, of course. It’s a bit of a wink to Tarkovsky. But I also like it! There’s a lot of talk in the play about the notion of secrets and how does a secret actually function. I am fascinated by this idea that you may have a secret but it’s essential not to tell anyone what it is. There’s a mysterious power in that. It is almost as if a secret has a metaphysical component to it. Yes absolutely. It’s what I tried to do for many years in other plays, because when I started to work with Ibsen, my problem with his plays was that he – Henrik Ibsen himself – always wanted to reveal the secrets. And background. To explain this character. Why do they behave in this way. Hedda Gabler’s father was a General, so she wanted to blah blah blah. Let’s take all of that away. I would say that that goes hand in hand with your affinity for Jon Fosse. Yes, I am sure somehow it came from all of my work with Fosse. I found a way to Ibsen that for me made it much more appealing. I like it when you say the secrets are metaphysical. If, in your eagerness, you try psychologically, socially, politically, religiously, to explain why people do what they do, then you miss the whole point. Because we never know. And to me, this is a very human and mystical perspective. Dotting every I and crossing every T, as we say in English, is not only less interesting dramatically, from a philosophical point of view, it’s incredibly reductive. Exactly. I am not a religious guy in that sense, but I believe that the complexity of a human life is almost endless. And you should not try to explain because then you reduce people. The capacity for people to do things – for evil or good — is so big. When you pick a play, they ask you “Why do you love this play?” And I am totally against answering that because if I knew, I would never do it. It’s an aesthetic technique also, in the sense that I personally like it in theatre, in movies, when I feel as a grownup I am able to draw my own conclusions. You have to invest something, use your own imagination. It’s a metaphysical point, but on the other hand, it has to do with what I find exciting, because I cannot do [as a director] anything other than what I like to see. You have to be yourself and do what you believe. You have to find the courage to say “I don’t care if they think that I should do a fast pace, use more video, whatever. I have to do it my own way, and in the end, I think that’s the only thing that works. Stan Schwartz is a freelance film and theater journalist with a particular interest and expertise in Swedish theater. He lives and works in New York City and is also a video artist.